The Water and Sanitation Division (WSD) of the Department of Engineering Services (DES) under the Ministry of Works and Human Settlement (MoWHS) in partnership with local NGO SNV have developed a programme for Sustainable Sanitation and Hygiene for All (SSH4A) in small towns in Bhutan. After successful pilot interventions in towns in Chukha District, the programme was scaled up to three more towns in Samtse District. As part of its Wastewater Management Plan (WWMP), the project studied different wastewater treatment technologies such as sequencing batch reactor (SBR), member bed reactor (MBR), decentralised wastewater treatment systems (DEWATS) and fluidised aerated bed reactor. These different technologies were compared on energy consumption, capital and recurring expenditure, reliability of the plant, consistency of treated sewage, and the ability to withstand variations in organic and hydraulic loads. Amongst all the above technologies, DEWATS was recommended as the most suitable low-cost wastewater treatment technology. The WWMP also recommended sanitary landfill and a faecal sludge management facility. The main objective of the work in Samtse is to design low-cost wastewater treatment technology (DEWATS) for Samtse College of Education and a sanitary landfill and faecal sludge treatment plant (FSTP) for Samtse Town. The facilities will be replicated to other towns, bringing them affordable and sustainable sanitation facilities. Capacity-building to support the operation and maintenance of the facilities is done through the training facility Centre for Advanced Sanitation Solutions (CASS) in India. The project was led by the Ministry of Works and Human Settlement (MoWHS) in collaboration with the Royal Government of Bhutan and SNV. The FSTP designed by BORDA has a treatment capacity of 3m3/day, treats faecal matter in a natural, cost-effective and energy-efficient way, and has minimal operation and maintenance requirements. 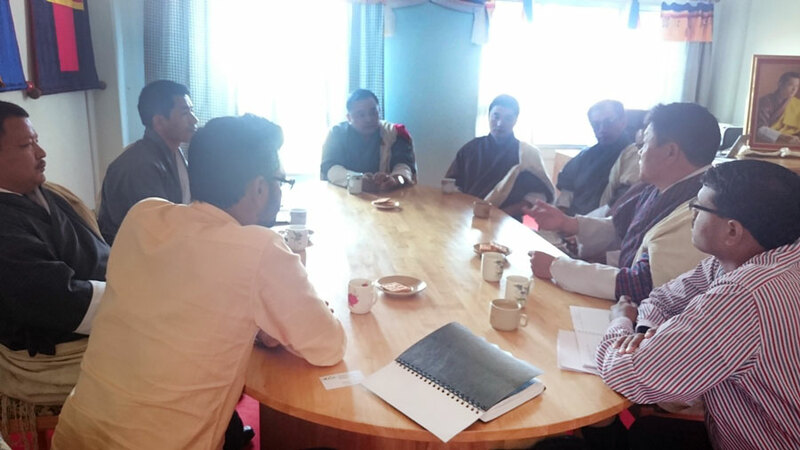 BORDA designed and technically supported Bhutan’s first FSTP for the town of Samtse in collaboration with Bhutan’s Ministry of Works and Human Settlement (MoWHS), the Royal Government of Bhutan and CDD Society. Like many towns and cities in Bhutan, Samtse (pop. 6,600) does not have an underground drainage (UGD) system. Most households depend on onsite septic tanks. The total area within the municipal boundary is about 3.65 km2 and is divided into eight main clusters for administration. Samtse Town has great potential at regional level for future development due to its location along the border with India and its close proximity to the vast markets of the sub-continent. Samtse Town is the seat of Samtse Dzongkhag (District).